The number one question I get asked is about how much my SEO services cost. SEO is and probably always will be something that is measured almost entirely on price. It’s unfortunate because the industry is classic case of ‘get what you pay for’. What stands out when I get compared with other SEO service providers is how there’s always a keyword limit for each package. Like people get sucked into the concept of being limited by keywords and then come along to me asking how much for X amount of keywords. That’s not how it works. And it’s not how you should be comparing SEO packages and SEO providers. I never limit clients by keywords. There’s only so many keywords to describe what you do or what you sell. And there’s this thing called the long tail. Long tail keywords are multi word combinations (usually 3-4 and sometimes more) that are very specific and usually the most relevant to a user’s query. “Hotels” and “Dubai hotels” are not long tail keywords. “Cheap Dubai hotel close to beach” is long tail. Only a fool will limit you to a handful of obvious keywords whilst neglecting the long tail and some of the ‘less popular but not quite long tail’ keywords that you could go for. When I take on clients, I’m usually running their site through Screaming Frog and ahrefs while simultaneously combing their site for keywords, putting together combinations in keywordmixer.com and then getting traffic volumes. I like to know what I’m up against and how people search. For example, in Dubai, it’s common for people to search for things like ‘apartments for rent in Dubai Marina’ but in a place like Morocco, they’d opt for something like ‘apartments rent marrakech’ (they’d do this in French but I’m making your life easy in English). In Arabic, people spell out Dubai Marina in a literal way, as opposed to using the official Arabic word which is Marsa Dubai. You gotta know what people search for – this is as basic as it gets with SEO! And with this there are a handful of keyword combinations you can come up with but are you targeting each and every single one one? no. You go after the high volume keywords that are relevant to your website because that’s where the audience is. And then you up the ante with your content by diversifying your keyword usage in your content to go after the other variants. But if you know the Toyota Corolla, they release a new model every year. And if you understand how people search, you’ll know that used car = secondhand car = pre owned car. And if you know cars, you’ll know people get specific about models from certain years. I have a 2007 Toyota Camry and I know that was a dramatic design change from the models before it and I wouldn’t go near the earlier models. I’m no fanboy but I know what I like! And I also digress. 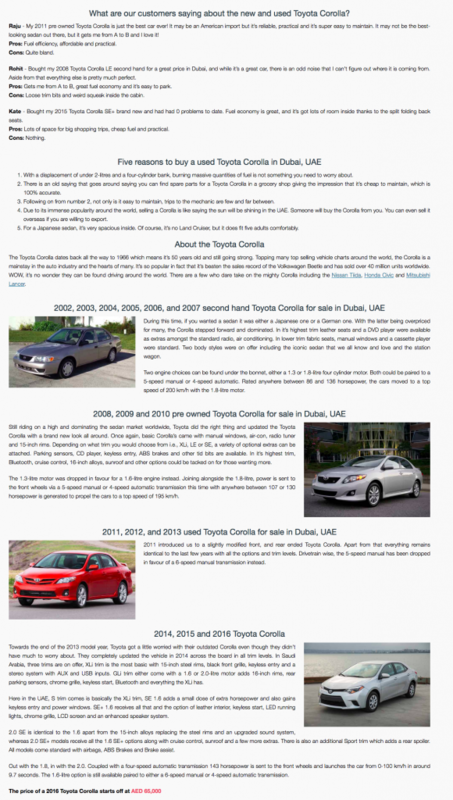 So how does Dubicars tackle “used toyota corolla for sale in Dubai” whilst also going after each model year and variations for how to say ‘used car’? The copy has been written to ensure that whenever you search for any keyword combination with those model years and the words used, secondhand or pre owned, you’ll find Dubicars. Imagine telling them that they could only target some models and years of their cars. They’d laugh and move on. An SEO package that limits your keywords has got it all twisted. The thought process is wrong. Yes, you need to do keyword research so you know what to actually focus on. But then you have to marry that with what the business does, how they operate and what is most beneficial to them. You simply can’t target all keywords equally, every single month. What you do is fix up the website so the basics are done (HTTPS, Robots.txt, Sitemaps, Cleaned up meta data and any obvious issues) and then you get down to the nitty gritty by tweaking meta data to use the right keyword combinations and you work on interlinking and content development. Look at the website for Atlantis The Palm Dubai (I had the good fortune of working on this when it first launched). Every part of the resort is important (and amazing) and has to make money. So every part of the website is also important and has to make money. If there’s a new restaurant launch or a focus on certain facilities or accommodation, then that’s what the focus should be on. It doesn’t mean you’re not targeting everything else – it just means you’re narrowing your focus and giving it extra attention. Make sure you’re smart with your keyword research. It needs to be comprehensive and detailed; no stone should be left unturned. Find every single combination that could possibly be used and figure out what’s most in demand. Then you get to work and optimise your site for what’s hot and then you go after the long tail. When I work, I ask clients what to focus on each month (where it makes sense to ask). Sometimes there’s a focus based on the season so that’s what happens. Other times, I just go after long tail keywords that could do with a ranking improvement. This is how you use your keywords wisely. Go after what matters, not what you’re limited to. Now that you’re not thinking about keyword limits anymore, let’s talk about real SEO for your website.